We hear a lot about co-branded credit cards these days. But do they really serve a purpose? And exactly which brand of the “co branded” dynamic are we showing loyalty to? Are they worth the hype, if say, we like one brand, but really aren’t into flying internationally (or some other offer that comes courtesy of one of the co brands)? We’re here to put co-branded credit card offers into context so that you’re making the best financial decisions as we head into a new year. A co-branded credit card is offered by two brands or parties. The most common co-branded offers include a retail store or business – gas companies, department stores, etc. 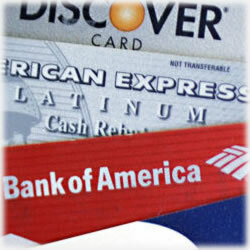 along with a credit card network such as Discover, American Express, Visa or MasterCard. Those who opt for these cards are offered rewards points, cash back, merchandise or other goods that aren’t offered to other customers. Card holders aren’t limited to just the brands on the card; they can use their card anywhere the network is accepted. Usually, the co-brands have compatible targets in mind. For instance, an airline may partner with a card network to market to international travelers. Co-branding isn’t necessarily new, but credit cards have only been in the game for the past decade or so. For awhile, co-branded offers had gone to the wayside; these days, however, they’re making a comeback as consumers are becoming more definitive about what they want – and what they don’t want. Here are a few of the more popular co-branded credit card offers available today. In one of the more popular offers, Chase teamed with Southwest Airlines for what’s become quite the lucrative partnership. It’s the consumer who benefits in ways other offers simply can’t match. Your first purchase earns you a free flight. On your anniversary date, you’ll see 3,000 points appear on your account, which is good for a $50 “Wanna Get Away” fare. Your bags fly free, there are no blackout dates, no expiration on your points and no shortage of reward seats. If there’s any drawback at all, it’s the $69 annual fee, but the Visa name makes it a safe choice and one certainly worth consideration. Another smart move for Visa, the United Mileage Plus card allows you to earn up to 40,000 bonus miles, which is worth $95. Your first bags are always checked free on all Continental and United flights, which can easily save up to $50 each trip. Also, customers report the early boarding is a bonus, especially in crowded airports. These priority boarding privileges have been a very smart move on United Airline’s part. Also, for every dollar spent at either Continental or United, you’ll earn double miles. All other purchases match miles per dollars spent. With many card offers promising access to various events, the Inside Access from Chase brings it to an entirely new level. Take advantage of balance transfers, a first year free dynamic in terms of the annual fee, and universal rewards. This credit card offer is comparable to the United/Visa. Every Delta flight allows you to check your first bag at no cost, you’ll receive double miles on all your Delta purchases and all other eligible purchases earns you a one to one ratio. Impressive savings of up to 20% on your Delta flights and priority boarding make this a tough offer to pass up. This is actually a choice many business owners are making, especially those that require employees to travel. A $95 annual fee is waived the first year, which rounds out this offer nicely. Among the many other benefits, OPEN card members are covered with complementary insurance on rental cars, emergency cash and card replacement services and of course, a zero fraud liability (which American Express is known for) ensures peace of mind. In the final analysis, if a co-branded offer doesn’t include those companies and/or products you use often, you might be better served with a traditional credit card offer that has those perks and benefits you will take advantage of. It might be a no annual fee or rotating categories that allow for additional savings is your better bet.